Lapis Azurite, or mountain blue, is a naturally occurring copper pigment. 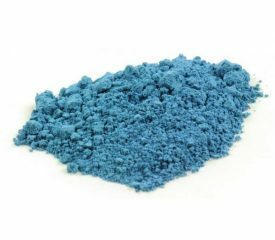 Before the arrival of Lapis Lazuli, this pigment was the most important blue pigment for European painters. They mixed it with their tempera paint. You will find lapis azurite especially in European renaissance paintings.